Matt Gallucci, Annie Tselikis and Lyle Brown during Seafood Expo Asia 2016 in Hong Kong. Shipping live lobster worldwide is a global business that focuses on a perishable product. Live lobster never stops, so neither do we. Our facility is open 24 hours a day and our customers call during their business hours — no matter which timezone they’re in. Several times a year, we have the good fortune to participate in seafood industry trade shows and Maine- or USA-sponsored trade missions. As a company, we prioritize this investment to have the opportunity to do business face-to-face with our customers. We also believe that learning about the culture, tradition, and food trends in the various regions where we do business is incredibly important. We like to understand how lobster is consumed throughout the world, learn about holidays or events that would force a peak in demand in certain regions or tighten the availability of services from perishable air freight capacity or international banking. Knowing our customers’ needs and how live lobster fits into their portfolio is incredibly important to us. Seafood Expo Asia, September 5-7, 2017: One of Asia’s premier seafood trade shows, this show takes place at the Hong Kong Convention & Exhibition Centre in Wanchai. You can find Maine Coast at Booth 5-815. Show attendees noted lobster as one of the top-10 products they are seeking. We would love to talk with you about your live lobster procurement. 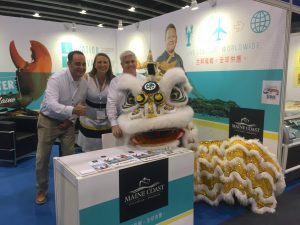 USA-Sponsored Southeast Asia Seafood Trade Mission: The Maine Coast team will continue on to Singapore and Bangkok to meet with our existing customers and develop new business relationships. Want to connect with our team? Email us for more information or set up an appointment. SEAFEX Middle East, September 18-20, 2017: The only professional seafood show in the Middle East/North Africa region. Annie is setting up meetings in Dubai with qualified live lobster buyers — contact her directly to learn more. China Fisheries and Seafood Exhibition, November 1-3, 2017: This rapidly-growing show at the Qingdao International Expo Center is one of our best opportunities to see our customers from mainland China each year. Find us at Booth E2-0502 in the USA Pavilion.